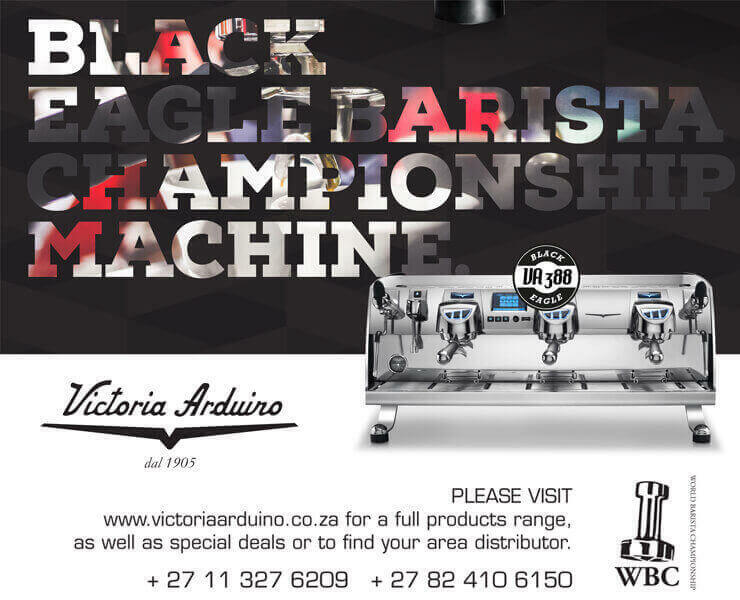 KZN Barista Competition at Durban GF&W Show. Win Tickets to Durban GF&W Show - We have 3 sets to give away! The Good Food and Wine Show Durban, plays host to the SCASA Coffee Competitions’ KZN Regionals Barista Championship at a dedicated Creative Coffee Theater. The competition promises to get pulses racing and not just because of the high caffeine content! The World Barista Championships is the world’s most prestigious barista competition, welcoming participants from over 50 countries who have won regional and national-level competitions to represent their domestic coffee talent on the world stage. So there is everything to play for, as the National Barista Champion goes through to compete at the World Barista Championships to be held in Seoul, South Korea, next year. Tim Krynauw (Ciro) is one of this year's favourites to win the KZN Barista Competition, placing second in 2015 and 7th at the SA Nationals. This competition is all about performance, skill and passion for coffee, as well as being able to pour delicious coffee under pressure, with a total of seven highly skilled judges watching the barista’s every move as they produce 4 espressos, 4 cappuccinos and 4 signature drinks, all in under 15 minutes! The Barista Competition is not the only coffee event that will be taking place. 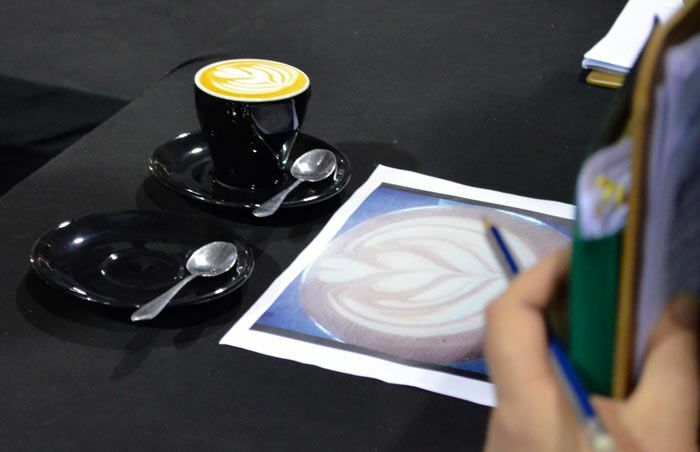 Visitors to the show will be able to witness the Cup Tasters Event, which is a test of the senses and there is also the popular Latte Art Event, where the baristas impress judges with their milk pouring skills, producing flawless tulips, rosettas and hearts to name but a few delightful patterns. The Latte Art competition in KZN always has a very high standard - Will the Famous Brands baristas defend their stanglehold on the Latte Art title or will Wency Masawi (Nino's ) go one better than second to become the KZN Champion in 2016? 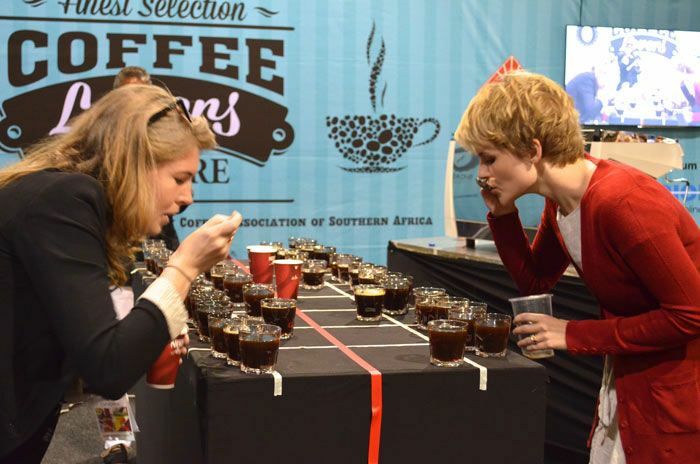 The public will have the opportunity to meet some of the provinces’ best coffee talent. If you’ve ever wondered about the world of Specialty Coffee, this is your chance to pick the brains of some of the best in the business from 28-30 October at The Good Food and Wine Show. Coffee Magazine Editor, Mel Winter (Left) placed 2nd behind Nino's Bernard Muneri in 2015. What else is happening at the GF&W in Durban 2016? Top South African chefs and food personalities will be taking to the stage when the Durban Good Food & Wine Show comes to town later this month. They include KZN’s spice sorcerer Sandren Govender, David Goette (who has eaten brownies with Dan Aykroyd and cooked for Ronald Reagan), Indian cooking authority Asha Maharaj and the talented Vanessa Marx who won Eat Out’s inaugural Rising Star Award in 2013. The theme for this year’s new-look Durban show is Fresh, created by the show’s curator, Hannerie Visser, and is all about one of the biggest current food trends. Increasingly people want to eat fresh seasonal produce and they want to know where it comes from. Others who will be delighting the crowds at the country’s premiere food, wine and lifestyle show are former The Greenhouse chef and TV regular Clement Pedro, health and wellness expert Lisa Raleigh, Top Billing presenter Lorna Maseko, “Gourmet Bushie” Sherwyn Weaich and Deborah Andrews. They join a stellar line-up – already announced – which includes George Calombaris, Siba Mtongana, Jenny Morris, Sarah Graham, Siphokazi Mdlankomo, Neill Anthony and J'Something. The show offers more value-for-money than ever before with nine theatres offering entertaining programmes in which your favourite chefs cook up a storm, included in the ticket price. It’s on a first come, first served basis. Says Vanessa Marx: “It’s a great opportunity for the public to interact with foodies and chefs. The knowledge they gain from attending the demonstrations is extremely valuable as they get to watch chefs creating dishes first hand and see how easy it can be to make fabulous food at home. These shows are a platform to expose the public to new ideas and trends, products and wineries. It connects the food and wine industry with the public. Asha is a renowned Indian cookery authority who travels the country giving cooking demonstrations, hosts a magazine programme on Radio Lotus, demonstrates on TV, has written five books, including a bestseller on eggless baking, and she has written for the cookery pages in the Extra section of The Sunday Times. She says the secret of a good Durban curry is “paying attention to spicing; there is a different masala for each curry”. David is the national culinary arts executive of the International Hotel School (IHS). Originally from the US, he has accumulated a variety of certifications and accolades over the years, including his Le Cordon Bleu Degree at the coveted California Culinary Academy. He has eaten and cooked in restaurants all over the world – including Dubai, London, Australia, Japan and Tanzania…to name a few. He has eaten brownies with Dan Aykroyd and cooked for Ronald Reagan while having had the opportunity to meet and work with some of the best chefs in the world. He is passionate about hospitality and culinary education in Southern Africa. Jenny Morris - aka the Giggling Gourmet - is one of SA's most-loved food personalities. She is an author, magazine writer, radio and TV presenter, celebrity chef, teacher, caterer, restaurateur and culinary tour guide who has had an ongoing love affair with food since she was a child. Not only has she conquered radio but Jenny has made several television appearances both locally and internationally. Her first show for the Food Network was Jenny Morris Cooks Morocco. It was the first occasion that a South African chef fronted their own show on the channel. She opened her own restaurant, Yumcious, in Cape Town last year. Portugal-born Joao Da Fonseca is better known as J'Something, the lead singer of South African band Mi Casa. But he's also a passionate cook and in 2014 showcased his love of food with the13-part series Something’s Cooking on Mzansi Magic which went on to reach over two million viewers. His follow-up series What’s For Dinner on SABC 3 reached 10 million viewers. When he’s not collaborating with chefs to demonstrate his cooking skills and love for soulful food, J'Something can be found working on his first cookbook or co-hosting a radio show. Kamini (pronounced like harmony with a ‘K’) won the title of MasterChef SA in 2013 and has since been living her food dream. She is an ad-hoc guest presenter on Cliff Central, she’s hosted a bi-weekly food segment on GoodHopeFM, as well as a weekly segment on Heart FM, and she’s demo'ed in the Celebrity Chef’s Theatre at the Good Food and Wine Shows in Johannesburg and Cape Town. In 2015, Kamini’s highly anticipated food-travel show Girl Eat World debuted on Food Network EMEA and, after a successful run, the show also aired on SABC 3 and Netflix US. Lisa is a self-motivated entrepreneur with a passion for health and wellness. Now approaching 15 years in the wellness industry, Lisa started a more public career as the blue team trainer back on SA’s The Biggest Loser and as the wellness consultant on SABC 3’s daily morning show, Expresso. She writes frequently for magazines and online platforms and published a bestseller titled No Fries on Us. Her latest passion project, Mumentoes, is an online hub of content dedicated to helping new families improve their health and lifestyle. Lorna is used to breaking perceptions and stereotypes, first making it into the spotlight as the first professional ballet dancer of colour in South Africa. This multi-talented powerhouse has since made her way from the stage to our TV screens, becoming one of SA's most sought-after personalities. Lorna has always had a passion for cooking, and in 2015 she became one of the top finalists for Celebrity MasterChef South Africa. Cape Town-based private chef Neill Anthony, who trained in the kitchens of Gordon Ramsay, Marcus Wareing and other big international cooking greats, gets invited to cook in the homes of prestigious clients, socialite friends and fun-loving acquaintances transforming their dining experiences into exclusive and private dinner extravaganzas. Partnering with local TV producers Okhule Media has been the foundation of his TV journey. His 13-part Food Network TV series Private Chef broadcast locally and internationally has been the launch pad for his international exposure. Head chef of the Sun Coast Towers Hotel, Sandren is the spice sorcerer at its Jeera Restaurant, a national award-winner for elevating Durban Indian cuisine to fine-dining heights. Super-Sandy, as he is known to his staff, buys his spices whole and his chillies fresh and – rare among such senior chefs - roasts, grinds and mixes them all himself, creating a different personal blend for each curry on his menu. Sandren grew up on a KZN North Coast sugar farm; his granny was his great inspiration. He trained in Switzerland and worked all over the world, including Mauritius and at the Waldorf in London, before returning home to KZN. Sherwyn has travelled across South Africa and Europe cooking alongside local and international chefs, learning and creating experiences through food. 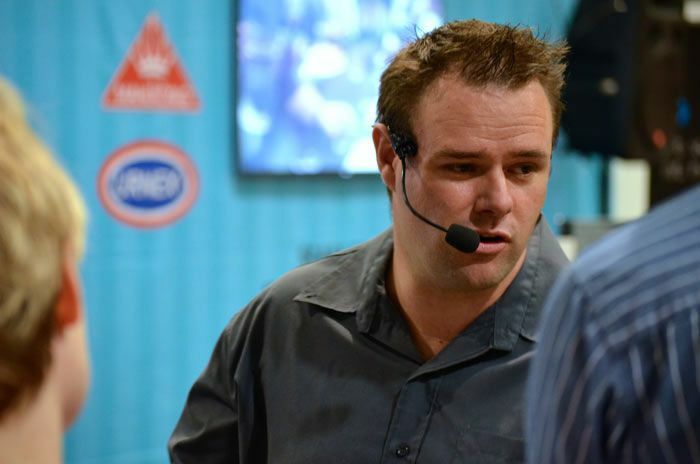 Known as the ‘Gourmet Bushie’, he has worked on Ultimate Braai Master which currently broadcasts internationally on the Travel Channel in more than 13 countries across four continents as well as on Expresso and etv Sunrise. He writes a weekly food column and online food blog with over 3.4 million readers and 1.4 million copies released across Gauteng and his hometown of Kwa-Zulu Natal. Vanessa grew up in the Eastern Cape. She attended The Institute of Culinary Arts in Stellenbosch for two years, graduating with a Grande Diploma in professional cooking and baking. Vanessa travelled around Europe, working as a private chef before moving to London where she worked as a chef at food and wine bar, Vinoteca. She won Eat Out’s inaugural Rising Star Award in 2013. Vanessa is the co-owner of Culture Kitchen, an events and festival pop up kitchen, caters for private events and undertakes freelance work and consulting in Johannesburg. The Good Food & Wine Show is bought to Durban by the following sponsors: Durban Tourism, SABC3, Core, Rolkem, Clover, Qantas, Taurus, Total Gaz, Sun Coast and Bidvest.